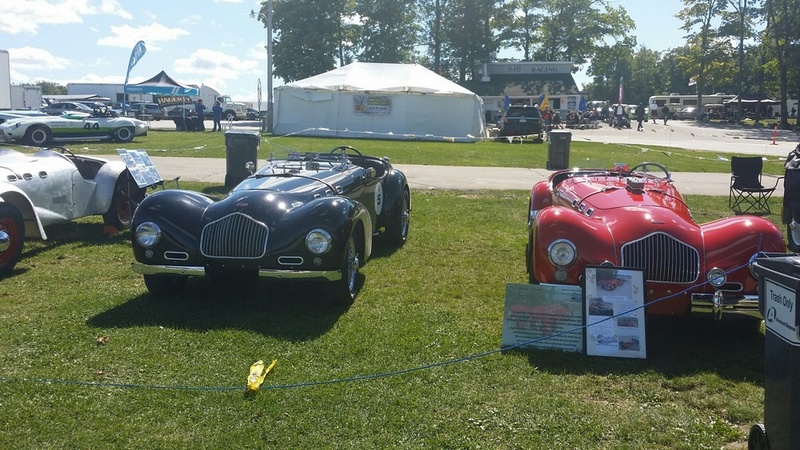 Deb and Mike Korneli, organizers of the September, 2015 Elkhart Lake Vintage Festival (ELVF) contacted Andy in the fall of 2014 on behalf of the Vintage Sports Car Drivers Association (VSCDA). They asked Andy if he could get some Allards to attend their annual event at Road America. If so, Allard along with Jaguar, would be the featured marques at this event. Andy got the word out, and succeeded in getting 17 Allards there – including his own burgundy Hemi-powered J2 and his blue Cad-powered K2. 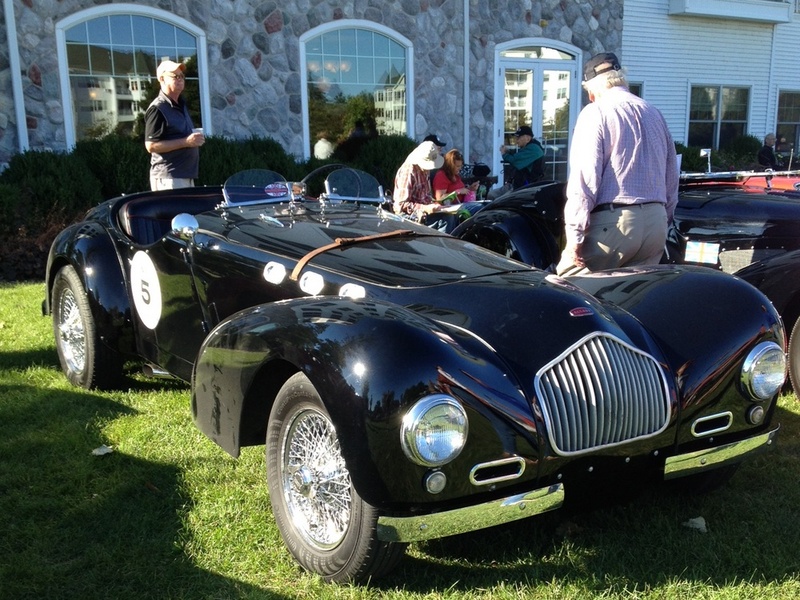 Events started that Friday, with an Allard display at the Road America Center, followed by the Driver’s Dinner at the venue. Saturday was a busy day, starting with the Road Course Re-enactment. This was a tour of the original road course, where the Road America event started 65 years ago. Several Allards attended this, along with the race cars and the display Jaguars. Following this, all the cars assembled on the lawn of the Osthoff Hotel. Andy Picariello’s J2 was placed beside Augie Grasis’ J2X. Both cars had competed against each other in 1953 – Augie’s being driven by Carroll Shelby, Andy’s by Dale Duncan. This was followed by an Allard dinner at Siebken’s Pub, arraigned again by Jere Krieg. Sunday was the race day. Allards were afforded a parade lap before the feature races. Andy had hoped that 4-5 Allards would be racing, but in the end was glad that two J2X’s would be able to thrill the crowds with their on-track bravado. Augie Grasis was at the wheel of his Carroll Shelby veteran. He started in second spot on the grid for Saturday’s Sprint Race, quickly took the lead, and had a great time dicing with a ’33 Ford Indy car to his first place finish. 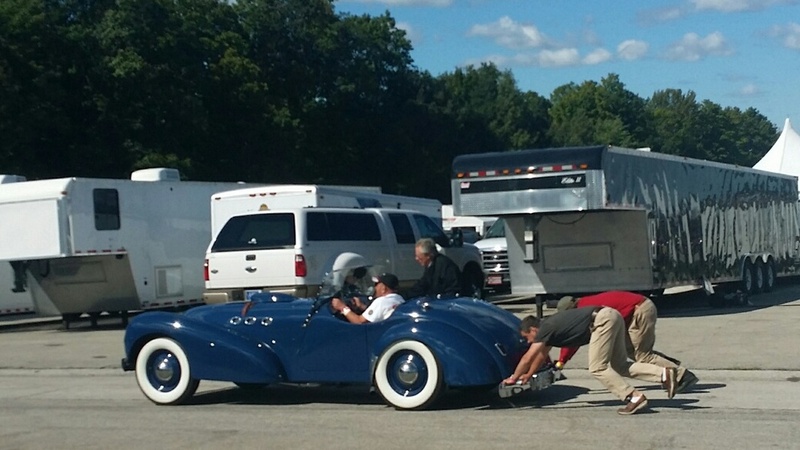 The Elkhart Lake Road Coarse reenactment tour was soon to follow – a great show for the spectators, but the slow stop & go driving caused heating problems for Augie’s Allard. The result – a blown head gasket that relegated his J2X to a static display role for the rest of the weekend. Vince Vento decided to enter his J2X just ten days before the event. Through diligent efforts on the part of his team and a certain measure of luck, he was able to get his car set up and delivered in time. Vince was experiencing some shifting problems with his Hydramatic during practice, so he prudently decided to forgo Saturday’s Sprint in favor of Sunday’s Allard/Jaguar Feature Race. Throughout that event both Vince and the race fans had a wonderful time experiencing and witnessing the Allard’s adrenalin imbalance as he wrestled his beast to a respectable finish. Tom Porter had a great time piloting his Allard J2X on the Allard Parade lap while wearing a 1955 driver’s suit and his late father’s vintage helmet. Bill Porter, incidentally, had owned and raced all four of the Porter family’s cars (a Jag E-Type, the J2X and two TIGA’s) at Elkhart Lake, so Tom and his brother Willy felt this occasion was especially nostalgic. Tom’s weekend was topped off when his J2X won “Best of Show – Allard Group” for Saturday night’s Gathering on the Green. The J2X field was filled out by Colin Comer and Barb Pinkenstein who brought their Allards over from the local Milwaukee area, along with Richard Hansen’s and Jim Netterstrom’s J2X’s. The J2 contingency was represented by Andy Picariello’s and Dana Mecum’s cars, along with Tony Cove’s ‘work in progress’ J2 that he trailered over from his home in Ontario. Many an Allard owner is intrigued by the opportunity to inspect an Allard project car that effectively displays so much of an Allard’s unique ‘innards’. Seeing these projects also gives encouragement as we work on our own projects. Keep up the good work, Tony! Bob Girvin’s unique Hemi powered Allard GT (one of two Allard GT’s, the last production Allard, and the only GT set up for racing), and was honored with the well deserved People’s Choice Award. The rest of the Allard field was rounded out by the three pristine K2’s of David Gaunt, Peter Zimmerman and Andy Picariello, Tom Kayuha’s K1, Terrill Underwood’s L-Type, Jere Krieg’s Palm Beach and Wilson Ryder’s J2X Mk II. Harold Haase made the trip from his home in CT – but alas, without his original and well preserved J2X – which is now on the way to its new home in Belgium. Per Andy, it was a memorable event, thanks to the hospitality shown to us by all involved. Deb Korneli did an outstanding job to assure that we had a good time. Jere and Julie Krieg served us well as our social secretaries. The long journey for most of us was well worthwhile.